Compatible with most mobile phones(especially for dual camera cellphone), simply clip to your smartphone rear (or front) camera, you can take high quality pictures without a heavy camera at anytime to make your trip colorful. Made of high-class glass, professional HD lens reduces glass flare & ghosting caused by reflections. Portable and easy to carry, a perfect buddy to recording your life. Super wide-angle lens 0.65 times to explore magical macro world, the photo has a a strong artistic appeal; You can shoot a wide range of scenery, such as the larger crowd, architecture and landscape, making the picture more clear. 180°fisheye lens provides you incredible and dramatic rounded images, which takes you into the stunning and fantastic world, so that you can experience the fantastic fish-eye world of images. 15X focused to 0.59-0.98inch distance to take pictures, for photographers to carry out close-up photography, ideal for shooting small objects, such as insects, flowers, stamps and etc. 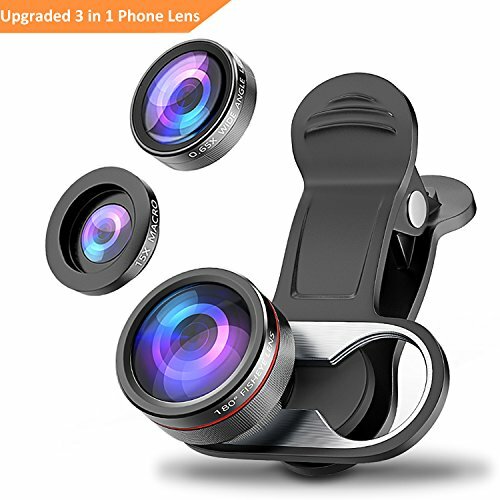 180° FISHEYE LENS: Screwing the fisheye lens on the clip, you can capture the dramatic rounded images with a 180 degrees on your phone, which will takes you into a fantastic and stunning fish-eye world. HIGH CLARITY LENS: With excellent multi-layered AR coating technology, the professional lens reduces glass flare & ghosting caused by reflections, gives you an experience of DSLR performance to capture stunning photography. WHAT YOU WILL GET: 3-in-1 camera kit, Lens cover, Wipe cloth, Storage bag and User manual; 45 days' unconditional money back, 12-month worry free warranty, and 24h all day friendly customer service. If you have any questions about this product by Stoon, contact us by completing and submitting the form below. If you are looking for a specif part number, please include it with your message.